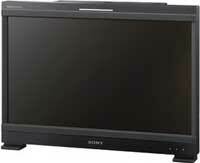 For professional applications such as colour grading, high-end editing, broadcasting and scientific research, Sony’s leading edge Organic Light-Emitting Diode (OLED) technology and signals processing technology ensures absolutely outstanding performance with the BVM-E250. The combination of the Super Top Emission OLED display panel and a dedicated professional display engine makes the BVM-E250 a truly state-of-the-art product. 24.5-inch (623.4 mm, diag.) Super Top Emission OLED display panel with full-HD (1920 x 1080) resolution and an RGB 10-bit panel driver. Sony's Super Top Emission technology is a micro-cavity structure which also incorporates colour filters. The micro-cavity structure uses an optical resonance effect to enhance colour purity and improve light-emission efficiency. In addition, the colour filter of each RGB further enhances the colour purity of emitted light, and reduces ambient light reflection. * DisplayPort will be supported from monitor software version 1.1 or later. * Requires the BKM-250TG 3G-SDI input adaptor (serial number 7200001 or later), sold separately. 3D signals are not displayed in stereoscopic view. Power consumption Approx. 72 W normally with input from a standard HDMI input. Approx 145 W at maximum load, with four option slots in use and maximum luminance compensation for any deterioration due to aging.